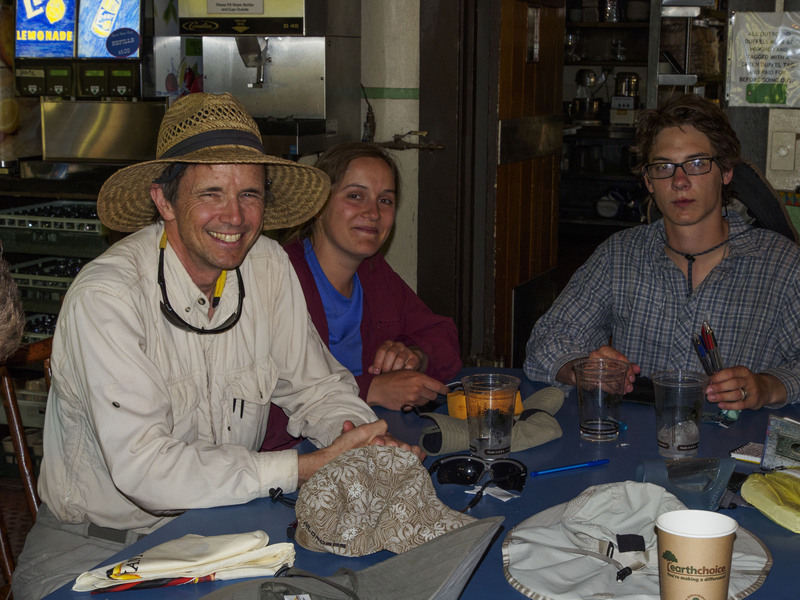 After we finished breakfast and packed the boats, Pete Kirchner usually called a “huddle” to let us know the plans for the day. He would ask for volunteers and let us know what needed attention, and then Rod would talk about what the river had in store for us. Today the huddle had a serious vibe, because we were at the beginning of Granite Gorge. 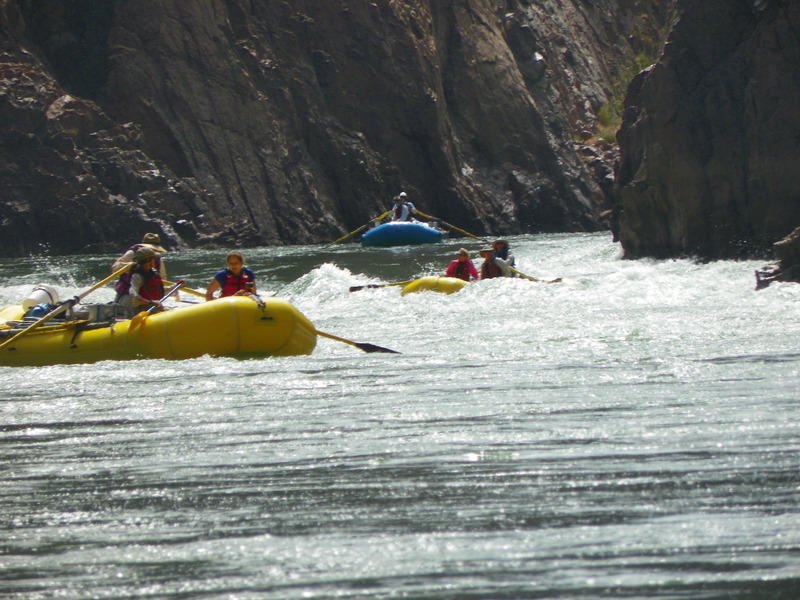 We would be going through some of the river’s biggest rapids over the next couple of days: Hance is rated 8 out of 9, Sockdolager is a 7, Grapevine is a 7, there were several more on the map, and, as Pete reminded us, plenty of rafts have flipped in rapids rated 3 and 4. Other kinds of fun were on the schedule, too. 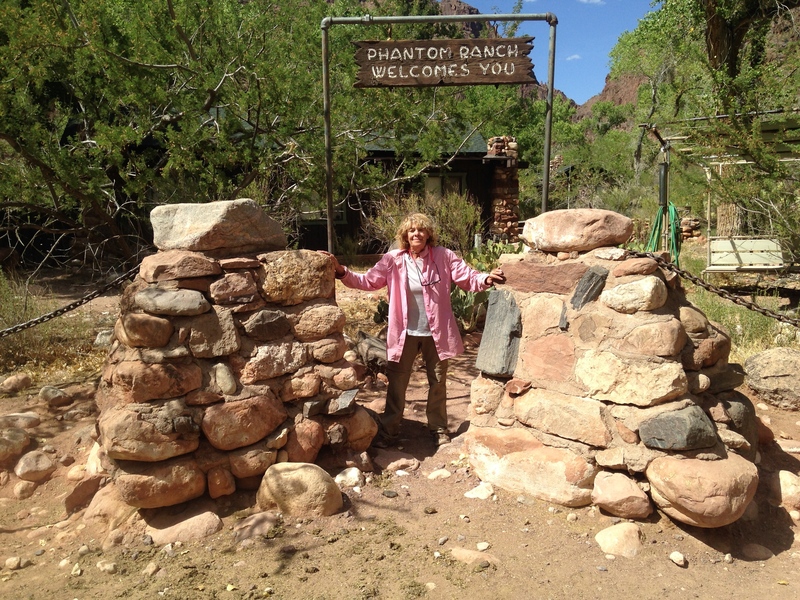 But Tania and I were especially looking forward to our visit to Phantom Ranch — specifically, to its pay phone. We pushed off at 8:15 am and immediately dropped into Nevilles rapid (rated a 6), which was bumpy but not bad. From the passenger seat, it seemed to me that navigating a big rapid was similar to driving in rush-hour traffic or skiing down a mountain. You’re in a state of heightened alertness, the chances of disaster are reduced if you follow a few rules, and there are also times where you’re screwed no matter what you do. Hance Canyon was a mile and a half ahead. 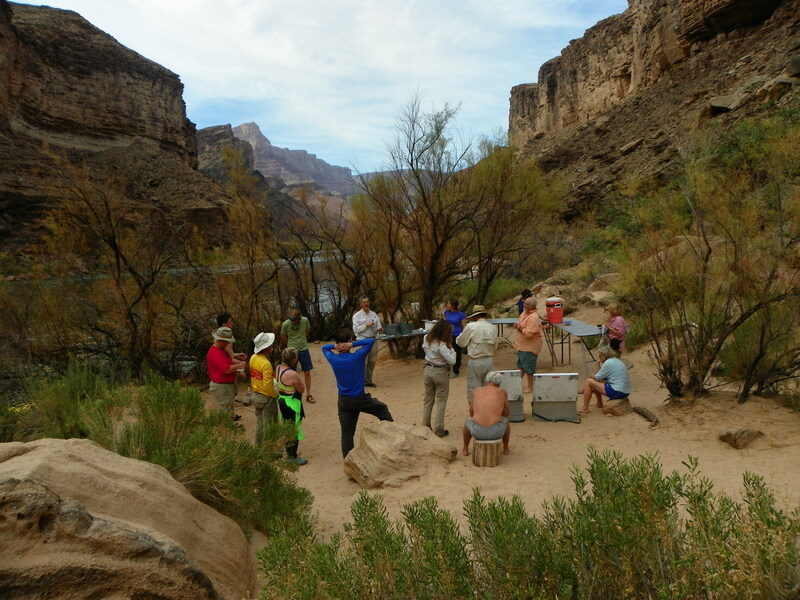 At the huddle, Rod had explained that this rapid had become more difficult two years ago when a flash flood had dumped a new load of boulders into the left side of the river. The debris made a previously safe run impossible on most days. The right-side run was possible, but there were lots of “pourovers” there, and it was unlikely that you would avoid them all. A pourover is a rock that is just slightly submerged, so that the water pouring over it creates a standing wave just below it. Between the submerged rock and the standing wave is a depression in the water, or a “hole.” Rafts get stuck in holes when they do not have enough momentum to get over the standing wave. When that happens, the raft gets caught in the rotation of the wave and is carried up the face of it broadside, making it much easier to flip. We pulled over at Hance and the boatmen took a full 45 minutes scouting it. Then we all took a deep breath and made it through OK. You can get a sense of the experience from videos posted on Youtube. A major rapid is about a minute of high excitement, perhaps a second or two of terror if things don’t go well, and then all is quiet again. But, like most crises, the moments are magnified in memory. Our trip happened when the water levels were low, which meant that the holes and the waves were not quite as big as they could have been. Still, they seemed plenty big to me. Upper Granite Gorge was weird, ominous, and beautiful. The dominant rock was Vishnu Schist, which was almost like obsidian – black, glossy, and smooth, with points sharp enough to tear flesh. During the day, the sun heated these black rocks so much that I had to wear gloves to touch them. They were shot through with pink streaks of Zoroaster Granite, plus other intrusions that were white or green. And the cliffs rise in nearly sheer cliffs that went up hundreds, perhaps thousands of feet. From the boats, it was impossible to tell how high the cliffs were. I liked that these ominous landscape features had fittingly exotic names. A few hundred miles west, in Death Valley, other terror-inspiring rocks have Satanic monikers (such as The Devil’s Golf Course), while the Granite Gorge rocks are named for a Hindu God and an Persian Prophet. Perhaps this is because geologists named the Grand Canyon rocks, and they were all college boys. Miners and guides named the ones in Death Valley, and their minds went to Christian images. But these guys were all trying to find fitting words for landscapes that made them feel scared and small, and made them think about infinity and unimaginable power. That’s what I was doing, too. 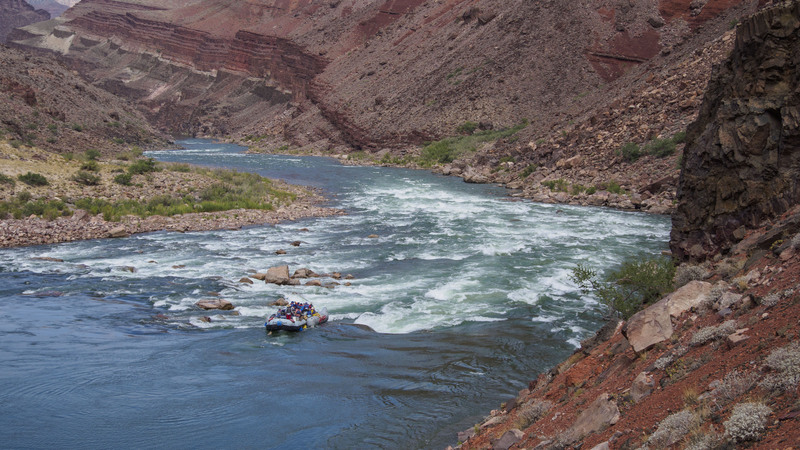 When the river is narrow and deep, boulders that fall into it from side canyons make more dramatic rapids because the river can’t spread out. These conditions also produce more powerful eddies. When the fast current from a rapid hits the flat water at the base of the falls, the water has nowhere to go but up. The jet slows down and thins out, and a backwash spirals away on either side. That’s an eddy, and the border between the current and the eddy is called an “eddy fence.” When you cross the fence, your forward motion stops abruptly and you may even start heading upstream. You have to pull hard on the oars to get back into the current. A good boatman learns to follow the current and avoid slack water, but this is not easy. Rod recalled a guide who said, as they suddenly found themselves spinning aimlessly, “Welcome to the land of ten thousand swirls.” Rod’s advice was to follow the bubbles. The faster water is less dense because waves have aerated it. As it calms down, it usually leaves a trail of bubbles on the surface. But not always. The river can be a hundred feet deep, and the current can dive and warp unpredictably. “Boils” are common, where upwelling water breaks the surface. These look exactly like a large spring, and they can also throw a boat off course. Rod, who rowed the lead boat with steady forward strokes, would often get sidetracked. We would see him pulling hard to get out of the eddy as we glided past. But just as often, Pedro or I would cross and eddy fence and Rod would glide past us. It took skill, finesse, and luck to do it right. Raft-rowing is a sport. When the bottom falls out, the next thing that happens is the wave, which makes the front of the boat go way up into the air while the back of it stays low. This is less dangerous when the narrower, lighter bow of the boat is the part that goes up high. When you hit a hole broadside, you are more likely to get into trouble. 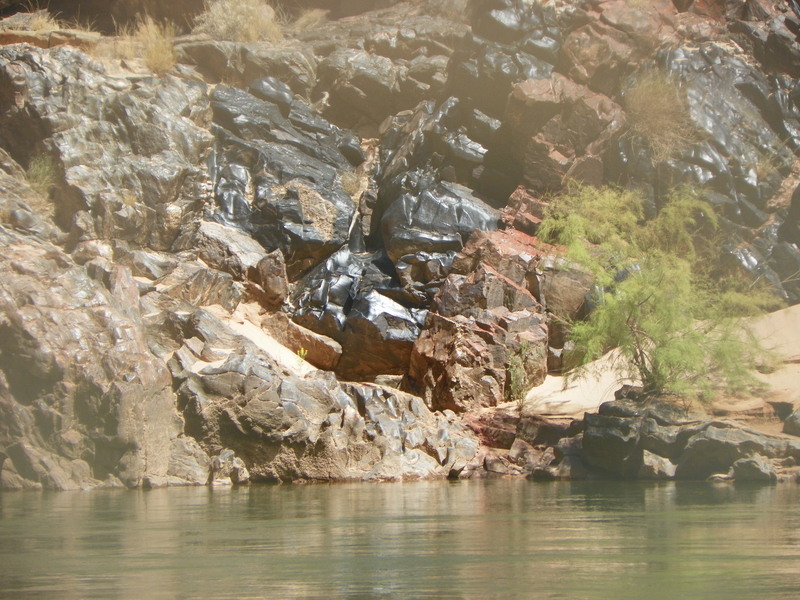 Grapevine Rapid was three miles further downriver. Jim was rowing a raft behind ours, with Mel and her daughter, Baer, in the bow (see photo, left). He hit a hole and started to turn; his raft started to go “high side,” which means it was on its way to flipping, as it struggled to get over the wave. The raft didn’t flip, but Baer (who was on the side that went high) lost her grip. She crashed into Mel (on the low side), and both of them went into the water. Jim was out of the hole a fraction of a second later and headed downstream. He couldn’t get a clear view of either of them, though, because he had to keep his bow pointed into the waves. Neither swimmer was injured, and both were quickly rescued by other rafts. Each raft had a weighted “throw rope,” which we all broke out like Boy Scouts; we had also been taught to communicate with hand signals, and if you patted your head, it meant that you were OK. Both Mel and Baer obediently patted their heads. We were back on our way in 10 minutes. Although the rapids are fearsome-looking and certainly dangerous, your chances of drowning are quite low if you’re wearing a life jacket when you’re dumped into the water. Just point your legs downstream, hold your breath when you go through a wave, and soon you will end up in the pool in the bottom of the falls, bobbing like a cork. It also helps to wear a helmet, just in case you hit a rock or something in the raft. People who are outfitted with life vests and helmets do get injured and have even drowned a few times, usually when they are trapped beneath a flipped raft and can’t find their way to the surface. But Pedro had thought of that, too. He had a knife clipped to his life vest, so he could go under and cut away any entangling straps that might keep someone submerged. We drifted two or three miles past Grapevine to Clear Creek, our first planned stop of the day. Wherever there is water near the surface of the desert, the ground is perfused with life. 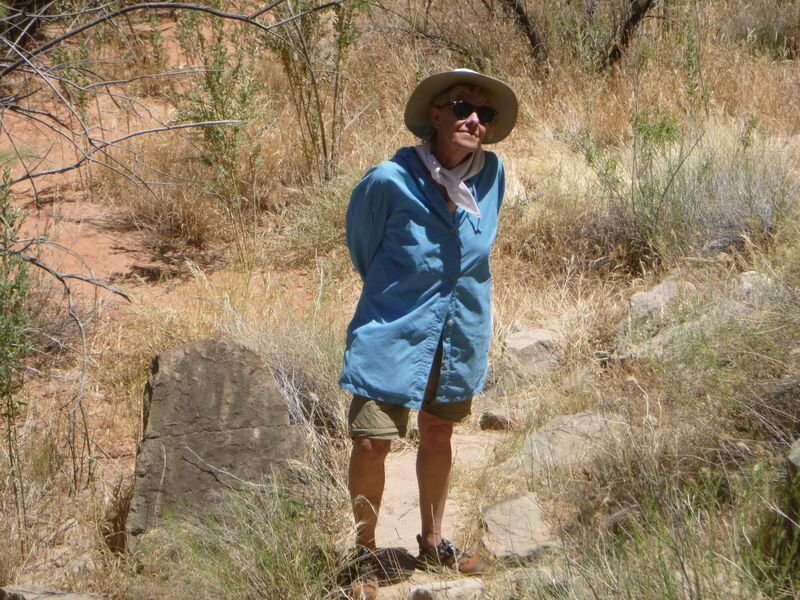 Sadly, desert riparian areas are often overrun by people, livestock, or invasive plants. 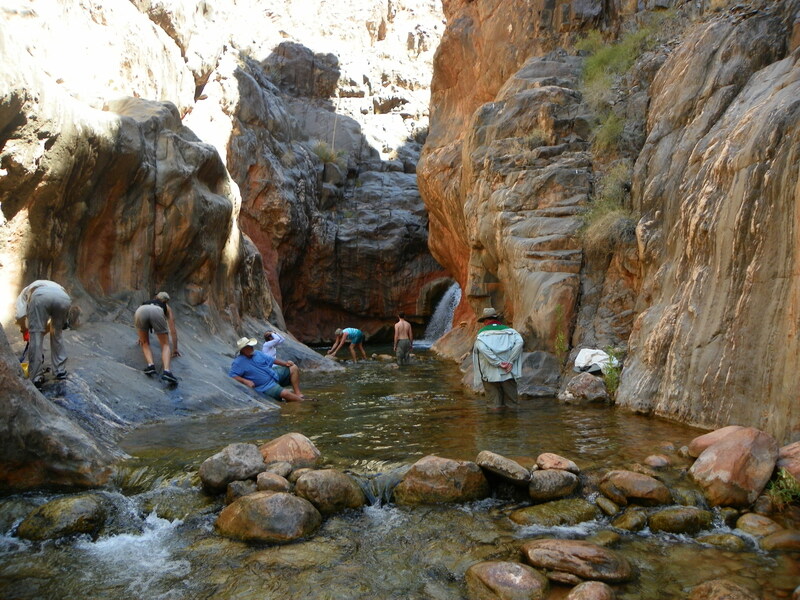 Clear Creek, and the other side streams we saw in the Grand Canyon, were different. Cow manure, herd paths, and litter were nowhere to be seen. 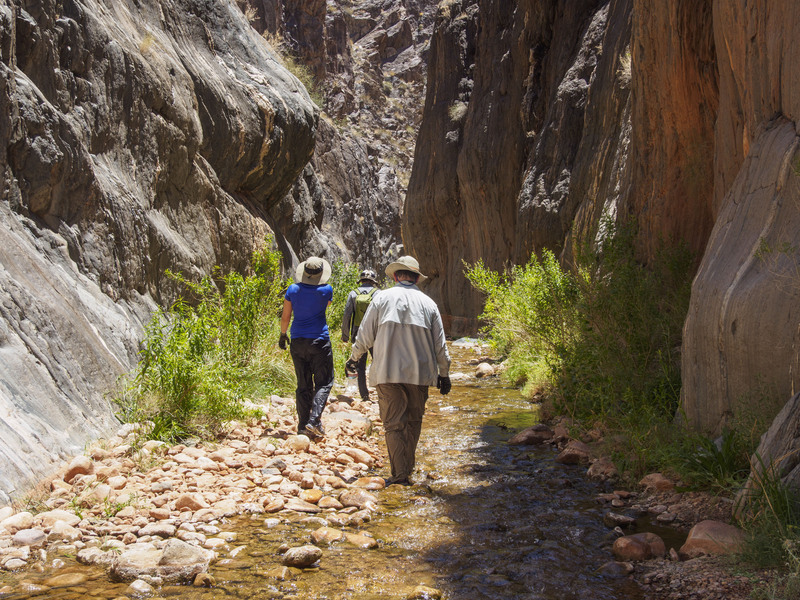 Invasive species are a problem in Grand Canyon (and also an opportunity for volunteering), but the remoteness of many places protects them from being overrun. And it seemed to me that all the rules and regulations on rafters were working. The contrast was stark. We pulled in at a small beach just upstream from the creek, so we wouldn’t mess up the mouth of the creek, and followed a faint trail to the top of a black schist outcrop. The late-morning sun was doing its best to incinerate everything it touched. I had brought along an old pair of garden gloves, which were essential equipment on hikes like this, because touching the black rocks barehanded would give you a first or second-degree burn. The trail was hard to follow and we went down a dead end, but eventually we crested the top and went down switchbacks into a canyon with a small stream. The stream was clear, with tadpoles and minnows in its small pools. Watercress and succulent plants grew on the banks, and taller shrubs occasionally provided shade. A lot of desert streams are choked by tamarask, Russian olive, or other invasives, but this one was an easy stroll. The cool wetness extended upward in an invisible canopy and the canyon walls gave lots of shade. We walked upstream for a little less than a mile. Tania is a slow hiker because she takes her time and notices things. 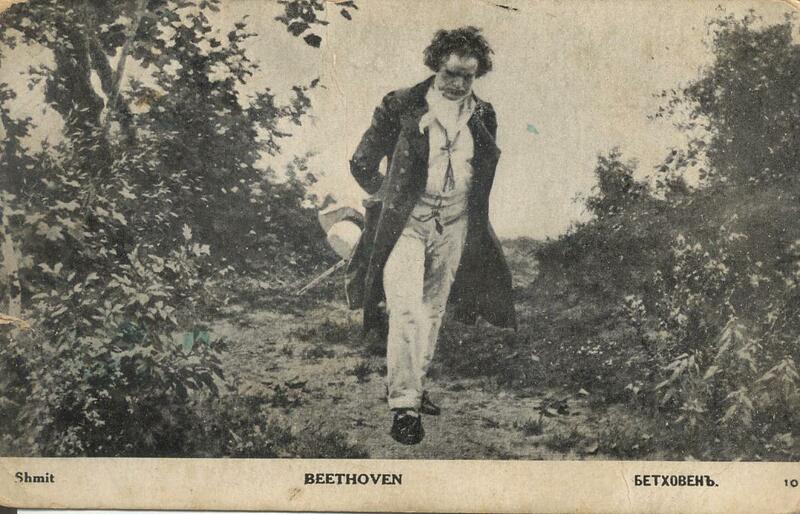 She has a habit I find intensely appealing – she strolls along with her hands clasped behind her back and her head pointed down, looking a bit like Beethoven walking through the woods. She isn’t writing a symphony, but she is immersed in the moment. Rod Metcalf is a slow walker because he has bad knees, and I am slow because I’m overweight (and also staying close to Tania), so the three of us lagged behind. 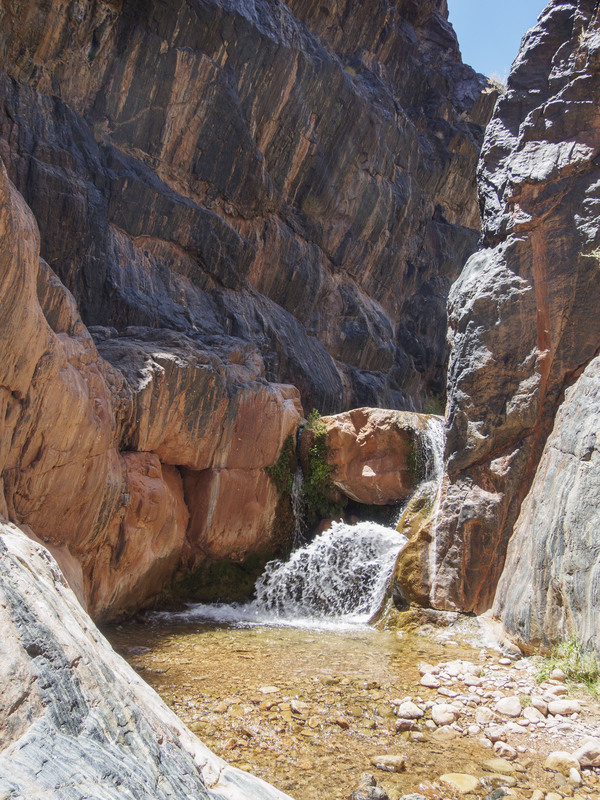 Our destination was a spot where the canyon was blocked by a 15-foot boulder that had a twist in just the right spot, so the water pouring over it sprayed out horizontally (also see the video at the top of the post). Places like these offer a magical combination of remoteness, comfort, and fun. We could have stayed for days. Unfortunately, we had five more miles to go and another stop at Phantom Ranch. Rod walked straight into the waterfall, soaked himself, and started walking back. Tania and I didn’t stay much longer, but we both vowed silently to come back someday. After lunch, back in the boat, Pedro gave me the oars and we sped through Zoroaster rapid (rated 5) and Eightyfive mile rapid (3) without incident. Shortly before 3pm we pulled into the small beach just upstream from Bright Angel Creek, which is slightly larger and a lot more built up than Clear Creek was. Phantom Ranch was quarter-mile up the trail. Phantom Ranch isn’t the only place in the Grand Canyon where you can rent a room, but it is the only one where the parking spots are for mules instead of cars. It is also the only place between Lee’s Ferry and Diamond Creek where a bridge crosses the river (actually two footbridges, close together, on the Bright Angel and Kaibab trails); the only place where a visitor can sit in a cool room and drink lemonade or iced tea with actual ice in it; the only place where you can mail a postcard; the only place you can fill up your water jugs without treating the water first; and the only place where you can make a phone call. We had reached the halfway point of our trip, and it was time to celebrate by doing all the things we otherwise couldn’t do. Tania and I bought cold drinks and peanut M&M’s, grabbed a stack of postcards, and wrote furiously for an hour. I think we posted 24 cards. We put them in a leather pouch, to be carried out of the canyon the next day on a mule train. Then we ran over to the pay phone and called Lydia, Tania’s mother. She was doing fine. 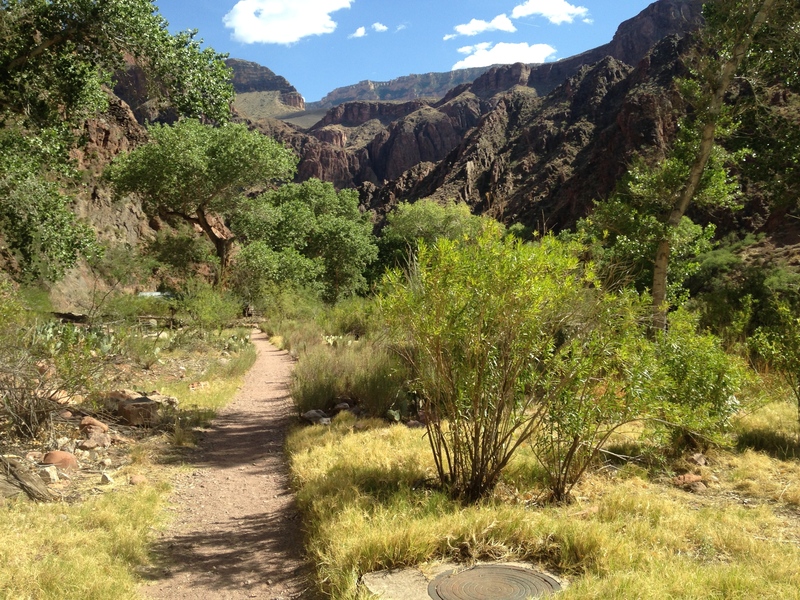 We can all thank Franklin D. Roosevelt for the phone at the bottom of Grand Canyon. 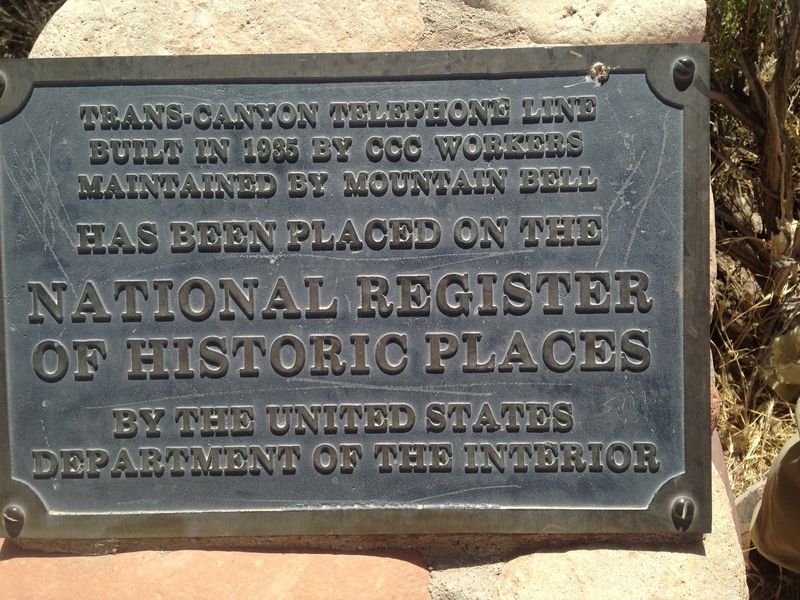 In 1935, a crew from the Civilian Conservation Corps strung a line from the South Rim to the North Rim; Mountain Bell (now Qwest, Inc.) is required to maintain it. I noticed that there was a radio playing in the kitchen at Phantom Ranch, so there might be a satellite dish out there somewhere, too. 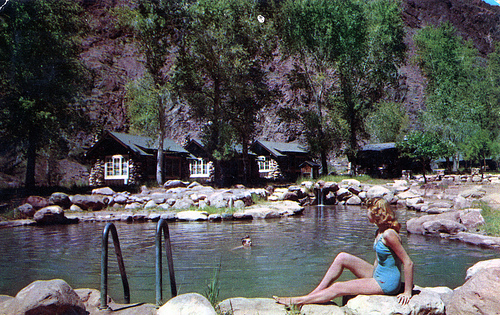 Phantom Ranch is an idyllic place (see the old postcard) and we wanted to stay there too, but time was up. After we got off the phone with Tania’s mom, I left a message for my kids and hurried back to the raft. Before the trip, Tania and I had been concerned about leaving her frail mother in the care of others for two weeks. After a week on the river, when we finally got a chance to check in, I was surprised that I hadn’t thought about it more. I hadn’t thought about work, either, or politics, or any of the other stuff that normally takes up the bulk of my mental real estate. The river had washed all those concerns away. We pushed off and were surprised to find that in the hour we had been off it, the river had turned brown. Rod explained that if there is a rainstorm anywhere in the watershed, a flush of sediment-laden water will run into the Colorado. The bigger the storm, the browner the river. The water quickly cleared up, though, and we didn’t see a brown river again. We went through Pipe Creek Rapid (a 3) and immediately pulled to the right bank to make camp. Mel, Tania, Pedro, Tracey, and I made pasta primavera with pesto sauce, Greek salad, and peach cobbler. 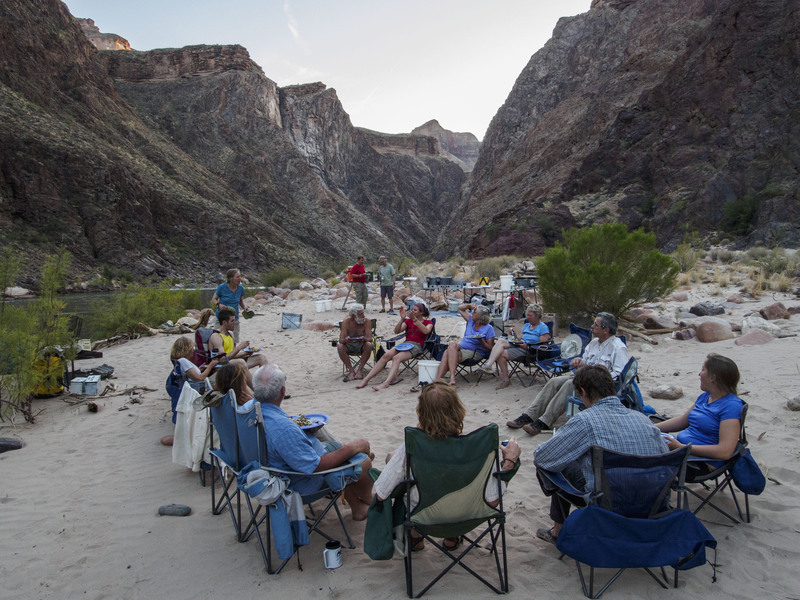 At dinner, sitting in the circle of chairs, we shared the feeling of a long day full of tricky jobs where everything — even the initiation of two new members into the Grapevine Canyon Swim Club — had gone well.